A lot of assumptions about PPMS have crept into the field and have become entrenched; we call these dogmas. We need to challenge the dogma; in particular that (1) PPMS in non-inflammatory, (2) PPMSers don’t have relapses and (3) PPMS is a different disease to relapse-onset MS.
Dogma 1: PPMS in non-inflammatory – WRONG! This pathology study done at Queen Square from the early 1990s clearly shows that PPMS is inflammatory, albeit at a slightly lower level than relapse-onset MS. The dogma has crept in because PPMSers have fewer focal lesions on MRI. This however does not mean that there is no inflammation; focal inflammation is simply occurring below the threshold of the MRI. What MRI sees in relation to focal lesions is simply the tip of the iceberg. The PPMS iceberg simply looks different with less above the surface. The positive ocrelizumab PPMS, or Oratorio, study supports PPMS as being inflammatory. Revesz et al. A comparison of the pathology of primary and secondary progressive multiple sclerosis. Brain. 1994 Aug;117 ( Pt 4):759-65. Background: The dynamics of primary progressive multiple sclerosis differ from those of the more common secondary progressive form. The observation by MRI that the frequency of enhancement with gadolinium-DTPA, a marker for blood-brain barrier dysfunction, is significantly less in the primary progressive form, has led to the hypothesis that inflammation is less intense in this group. Aims: To test this, we have studied postmortem material from 9 cases judged from a retrospective analysis of case notes to show clear clinical evidence of either primary progressive or secondary progressive disease. Methods: 578 lesions were analysed. Results: There was significantly more inflammation in secondary progressive multiple sclerosis (as judged by the frequency of perivascular cuffing and cellularity of the parenchyma) than in primary progressive disease. Conclusions: These observations have implications for therapeutic strategies in progressive multiple sclerosis. 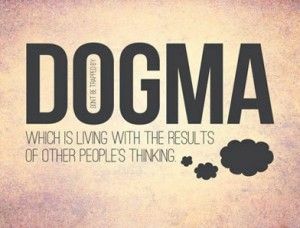 Dogma 2: PPMSers don’t have relapses – WRONG! In almost all PPMS trials done to date a proportion, albeit a small proportion, of PPMSers go onto have relapses. For example in the Rituximab trial in PPMS (Olympus Trial), 11 out of 439 (2.5%) of study subjects had a relapse during the 96 weeks of the trial. Hawker et al. Rituximab in patients with primary progressive multiple sclerosis: results of a randomized double-blind placebo-controlled multicenter trial. Ann Neurol. 2009 Oct;66(4):460-71. Similarly, about 5% of study subjects in the glatiramer acetate PPMS, or PROMISE, trial had relapses. Unfortunately, the exact number of relapses is not reported in the main manuscript. What is reported is MRI activity; 14% of 938 study subjects had Gd-enhancing lesions on MRI during the study. The latter is the MRI equivalent of relapses. Can we say therefore make the claim that PPMS is non-relapsing? Wolinsky et al. Glatiramer acetate in primary progressive multiple sclerosis: results of a multinational, multicenter, double-blind, placebo-controlled trial. Ann Neurol. 2007 Jan;61(1):14-24. Dogma 3: PPMS is a different disease to SPMS – WRONG! Did you know that it is not that uncommon in siblings pairs with MS for one to have relapse-onset disease and the other to have PPMS? 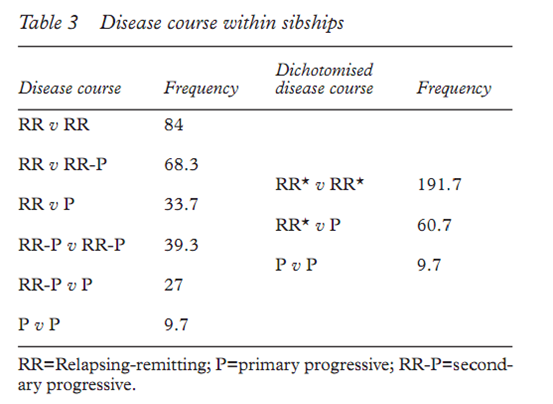 The figure from the UK sibling study is in fact 23% (please see article and table below). This indicates to me that relapse onset and PPMS are the same disease. Chataway et al. Multiple sclerosis in sibling pairs: an analysis of 250 families. J Neurol Neurosurg Psychiatry. 2001 Dec;71(6):757-61. Other arguments in favour of PPMS and relapse-onset MS being the same disease relates to genetic and natural history studies. PPMSers and relapse-onset MSers have the same genetic background. Once relapse-onset MSers enter the clinical apparent phase of SPMS they progress at exactly the same rate as PPMSers. It is for the reasons above that there is a strong argument for doing trials on combined populations of progressive MSers. In other words we should combine PPMS and SPMS populations into one study. The latter will simply be going back to chronic progressive MS classification that existed before we split MS in different subtypes. I am aware that this is a controversial topic but it needs debate. If we don’t do this then treatments will only be licensed for one subtype of progressive MS, and not the other clinical subtype, until additional trials are done. Additional trials cost money and time. Time is not a something people with progressive MS have on their side. 5-years in the life of someone with clinically-apparent progressive MSers may be the difference between using a walking-stick and being bed-ridden. In short, pwPPMS have unfortunately missed out in the relapsing phase of the disease. They are simply unlucky that a new lesion did not occur in a clinically-eloquent site to cause a relapse and bring them to the attention of a neurologist earlier in the course of their disease. They only present when they have lost their reserve capacity. The good news is we now have a positive trial of ocrelizumab. Let’s hope the regulators and payer allow pwPPMS access to ocrelizumab. So genetics is not the answer, not to say that genetics does not predispose you to PPMS e.g. being male and black. However age has been a factor. FWIW, I'm an identical twin with PPMS. My twin was diagnosed earlier with RRMS. Told it was not unusual. Thanks for confirming this, I am not sure where this information is published. Is someone can enlighten me if they know of the papers, as it speaks to PPMS and RRMS being the same disease. Treating inflammation obviously has an effect in MS, but do we really know that the progression is not the core, the beginning, the real disease? Perhaps excacerbated by relapses in some people more than in others? Personally, I don't think that anti-inflammatories like Ocrelizumab are the answer. Although Ocrelizumab seems to do something, it has to be weighed against side effects. I think we have to be careful what we mean by inflammation, there is T and B cell inflammation and glial inflammation, both with same name but with different treatment requirements. In the beasties we know that the T cell inflammation gives rise to glial inflammation that no longer responds to T cell therapy. It is clear that B cell therapy can block peripheral immunity. The question is are the B cells in the brain the problem in progressive MS.
ProfG being glass half full will entertain this idea but antibodies are probably not the best way to target them as they have problems getting in the brain. I don't know the answer for ocrelizumab but alemtuzumab does not get rid of oligoclonal bands. and may be by adapting the dose more can get in. Sipe JC1, Romine JS, Koziol JA, McMillan R, Zyroff J, Beutler E.
Cladribine in treatment of chronic progressive multiple sclerosis. Neurologists with no knowledge of which medication the patient was receiving examined the patients monthly.Cerebrospinal fluid and brain magnetic resonance imaging (MRI) examinations were done at 6 and 12 months. Average neurological scores, demyelinated volumes on MRI, and concentrations of oligoclonal bands in cerebrospinal fluid were stable or IMPROVED in the patients receiving cladrabine but continued to deteriorate in patients on placebo. I think you will get push back from pwPPMS in response to this article. I think this is because people like to be labelled and to be part of a tribe. Even when that means they won't get treatment that would have helped them – being in the tribe is more important. Last year I questioned the utility of PPMS, RRMS, SPMS and RPSM labels. All they seem to do is exclude people from treatment that could potentially benefit them. I came to the conclusion that it's all pretty much crap and much of it is not supported by MS pathology. More than that – they confuse neuros and lead to decision making based on whether a "relapse" is "felt" by the person. From what I understand, a clinical relapse is in fact a symptom. A person who wakes up one morning and can't use their right arm is experiencing a symptom of MS – the same way that when you have an infection, you might feel lethargic, in pain, have swelling etc. But if you are not lethargic, if you are not in pain and if you do not have obvious swelling: you CAN still have an infection. Dividing MS on the basis of symptoms rather than pathology is not just problematic, it's scary. When I questioned the utility of MS phenotypes, even those neuros who understand where I was coming from would murmur something unintelligible in defence of the phenotypes. I don't think the problem lies with people needing to belong to groups. Cordelia where is your evidence for this comment? I have PPMS and find your comment bizarre and offensive. Doesn't this give rise to the question, if the drugs which were supposed to stop or slow progression of rrms, wouldn't they should slow the progression of ppms ? If indeed the progressive stage is the same. Andy Clarke, not if the trials weren't powered enough to pick up the results. Also, no one can say with any certainty as a % of a person's MS damage, how much was caused by "progression independent of inflammation" v. how much was caused by inflammation. So, an anti inflammatory treatment for a personal called PPMS1 could have a completely different effect on another person called PPMS2, because of the processes that we cannot see. Interestingly enough, all of these observations coming out from Barts over the last month or two lend support to what the HSCT proponents have been saying for some time. HSCT is not a cure and is no magic. It is an anti inflammatory treatment. Does it work for progressive MS (does it work for progressive MS when it contains rituximab as part of the protocol)? Who knows, we don't have the evidence…………. Should we get the evidence? Who is getting the evidence? So who is getting the evidence? You have registries but we need class 1 evidence? Yes someone should get class 1 evidence………….. If the trials were based on hand fucntion one may well see an effect of these drugs but it is clear immunosuppressive drugs are only a part of progressive MS . Does HSCT work for progressive MS not as well as for RRMS, but will some people with progressive MS gain from HSCT I think yes is the answer. But one has to ask what is the conditioning regime, rituximab is not going to get in the brain and so can leave inflammation untouched there. MouseDoctor "rituximab is not going to get in the brain and so can leave inflammation untouched there". Can ocrelizumab get into the brains then? My neuro has told me they are the same drug with different name and price tag! Joanna, below is a short extract on the theories about rituximab/ocrelizumab in the brain- I don’t know if there has been an update about the issue. The Fab domain of rituximab binds to the CD20 antigen on B lymphocytes and the Fc domain recruits immune effector cells that result in B-cell death. Rituximab is thought to deplete B cells by all three suggested mechanisms of action for anti-CD20 antibodies: antibody-dependent cell-mediated cytotoxicity, complement-dependent cytotoxicity, and by induction of apoptosis [Clynes et al. 2000]. Despite rituximab concentration in the cerebrospinal fluid (CSF) being 10-fold less than the concentration achieved in the peripheral blood of patients with normal blood–brain barrier, it was shown to be active in the central nervous system (CNS) [Ruhstaller et al. 2000], which could be of interest when treating MS. Compared with rituximab, ocrelizumab in vitro causes increased antibody-dependent cell-mediated cytotoxic effects and reduced complement-dependent cytotoxic effects [Kappos et al. 2011] and, hence, might modulate pathogenic response in vivo more effectively than rituximab does. Mousedoctor: you mentioned in the comments above that cladribine gets in the brain and we need to know if the b cell deposits found in progressive MS patients’ brains are linked to damage/disability. Therefore whether rituximab gets in or does not get into the brain is irrelevant when it comes to HSCT. My original point was that the two recent ideas or ‘revelations’ that ocrelizumab/rituximab and some other immunosuppressive treatments may have a role to play in some progressive MS (noting our ability to pick up focal inflammation is limited) AND the recent emphasis on the idea that MS phenotypes are not based on biology but on observable symptoms = part of the explanation for the published efficacy of HSCT on ‘progressive MS’. To agree or disagree with me you would have to read the actual studies and their reports about published efficacy of HSCT on progressive MS. I’m sure you are too busy and have better things to do. Anonymous, would you be so kind as to post links to any published research on the positive efficacy of HSCT in progressive MS patients? This would be much appreciated. I've written quite extensively on HSCT on my blog, and almost all of the research I've found states without much equivocation that HSCT should not be practiced on patients who don't display signs of active inflammatory disease. Seems that the most experienced HSCT practitioners (Burt, Freedman, Saccardi) all specifically state that hsct is not effective on most progressive ms patients (those not displaying active inflammation in the cns). The few papers I found that suggested some efficacy were all quite old, from back when HSCT was first being explored for use in multiple sclerosis (late 1990s-early 2000s). I reached out to Dr. Burt's researchers about this, and they stated that although he at first thought the procedure applicable to progressive MS, the experience he accrued through the years – both in animal experiments as well as treated human MS patients – convinced him otherwise. The only paper I found indicating positive results in progressive MS was the Fedorov paper, which is one of the sloppiest pieces of medical research i've ever read, filled with contradictions and statements indicating that it's findings should not be compared to other research due to lack of patient histories pretreatment and follow-up post treatment. I would be quite encouraged to see any newer abstracts that indicate positive efficacy for HSCT in progressive patients. This would be quite encouraging. I have of course read the anecdotal reports given by individual patients, but have not come across any peer-reviewed published research in this regard. I thought I sent this for posting yesterday, but it seems not. The term "published efficacy" does not translate into "published positive efficacy of HSCT" the same way that the published efficacy of Ocrelizumab on PPMS does not mean that ocrelizumab is a cure (just that a person with PPMS taking Ocrelizumab may or may not experience a 24% reduction in confirmed progression). As you know, there have been suggestions that HSCT has some effect in progressive MS, though most experts agree the procedure is too toxic for the benefit to outweigh risk. Rather than link you to the studies you already have, I’ll just point out that Saccardi (2012 Paris presentation – what did we learn from ASTIMS), Fassas et al 2010, Burt et al 2003, Xiu Shi Ni et al 2006, the Swedes in 2014 (forgot the authors) – all refer to some kind of effect of HSCT on progressive MS: how much and how long is up for debate and is not enough in any event: just like Ocrelizumab. I think we can both agree that the literature has consistently found that younger patients who are otherwise fit and healthy, have had MS for less than 5 years since diagnosis and have focal inflammation in their CNS tend to have better outcomes form HSCT. Does this describe the majority of progressive MS patients? I don’t know, (why on earth would that matter in the context of what I said?). My note that our ability to pick up focal inflammation is limited does not mean HSCT cures progressive MS. At the same time, can every person without an enhancing or new MRI lesion in the 12 months prior to HSCT be said to no longer have focal inflammation in their CNS? I know 2 neuros who knocked back a person diagnosed with RRMS, 4 years since diagnosis, EDSS 3.5 to 4 (but walking unaided and almost without limitations) without new lesions in the last year seeking Lemtrada. They were prepared to give gilenya instead. The fourth neuro gave the person Lemtrada: the same MRis and the same background story, same EDDS. What was different? Again, I wasn’t arguing that HSCT cures progressive MS, I was pointing out that the published efficacy of HSCT in progressive MS could be explained in the same way as the published Ocrelizumab PPMS trial data is being explained. I am grateful for your kind peaceful cheeky way in which you pose your question, but I am curious: what was it about my statements that caused you to pull out your smiling ‘prove it to me’ comment? Sorry, I think you've misread my response to you as being passive aggressive. I actually wasn't trying to be cheeky or even mildly sarcastic, I thought given your obvious knowledge pertaining to HSCT that you might have come across some research that I'd previously missed. I think you and I are pretty well aligned in our assessment of the efficacy of both Ocrelizumab and HSCT for progressive MS patients. There may be some efficacy in patients with active inflammatory disease, but this is a minority of people with progressive MS (about 15% when talking about PPMS). And, yes, these patients would tend to be younger, less disabled, etc. Ocrelizumab has a terrifying cancer-causing profile, though. PPMS is a horrible disease. The worst and the most hopeless. The disease isn't taken seriously enough. Certainly, there is an inflammatory component to PPMS, but the big question is whether or not inflammation is the primary driving force behind progressive disease? Quite clearly, treating the peripheral immune system has historically had little effect on PPMS or later stage SPMS. It may be argued that the progressive MS trials using immunosuppressant drugs were underpowered or were of too short duration, but the preponderance of evidence would strongly suggest against the peripheral immune system playing a primary role in progressive disease etiology. In fact, the most severe forms of immunosuppression/immunomodulation, HSCT, also does not appear to be effective in treating cases of primary progressive or secondary progressive disease in the absence of enhancing lesions. The Ocrelizumab trials, in my humble opinion, leave many questions unanswered. The trial was obviously frontloaded with patients more likely to respond to the drug, based on earlier data gleaned from the old Rituxamab trials. So is it really a surprise that the PPMS Ocrelizumab trials were deemed a "success"? When broken down by subset, the group of patients without enhancing lesions was underpowered, so even though there was a trend towards efficacy, no such conclusions can be drawn. There are other concerns regarding Ocrelizumab as well. Let's not forget that the lupus and Crohn's trials were halted because of cancer deaths, whereas the MS trials were allowed to continue only because of the perception that MS patients were more willing to take on risk. Rituxamab, which targets the exact same cells and uses the exact same mechanism as Ocrelizumab, appears to be a much safer drug, having been in use for over two decades with no sign of the cancer risk that has already been seen in Ocrelizumab's limited use. And let's not forget, the only reason Ocrelizumab was developed is because Rituxamab was due to come off patent in 2016, thereby robbing the pharmaceutical company of the ability to make ungodly amounts of cash on the drug. I fear that the hype surrounding Ocrelizumab is raising false hopes among many in the PPMS community, those who have longer standing disease without any signs of active inflammation, who most likely will not be Ocrelizumab responders. For those who do have enhancing lesions and/are relapses, why not put them on Rituxamab, a cheaper and perhaps safer drug? I agree with this. There are neuros in US who want to put their PPMS patients on Rituximab, rather than Ocrevus, due to safety concerns. Yet Rituximab is off-label and U.S. insurance companies rarely cover it — even though it will be far cheaper. I may just pay cash for Rituximab when it goes off patent to avoid the risks of Ocrevus. And who knows if Rituximab will really do anything for someone with PPMS and no active lesions? What a mess. My impressions is that the MS research community (and perhaps the Barts blog) underestimates the concerns MS patients have about the cancer results in the various studies of Ocrelizumab. This is why oratorio trial was loaded with younger pwMS and those with active disease (about 30% in trial verses 15%) and hey they got positive results, done in a way it can't really be linked to active disease, e.g. did the person become active after a negative scan? Will they not buy it and restrict it to active PPMS, they will clearly gain from this. The overall incidence rate of breast cancer is 201 and 206 per 100,000 person years for patients with MS and those without MS, respectively. There is no association between MS and overall risk of breast cancer. The incidence rate of premenopausal breast cancer is 81 and 86 per 100,000 person years for patients with MS and those without MS, respectively. There is no association between MS and premenopausal breast cancer. The incidence rate of postmenopausal breast cancer is 163 and 173 per 100,000 person years for patients with MS and those without MS, respectively. Overall, the risk of postmenopausal breast cancer is 13% higher among MS patients, which is statistically significant. It seems to me that current progressive trials are done on people with early progressive MS (whether PPMS or SPMS). I dare say, from my own experience, it is possible that some of these people may not even have true progressive MS (perhaps just an MS that looks to a naked eye progressive). I feel that all the excitement is about transferring a portion of the "maybe progressive, maybe partly progressive" people with MS who we previously didn't treat (dogma?) to now opening some treatment options to them (nowhere near close to a cure, perhaps just buying a bit of time here and there). None of this addresses the core of the 'true' progression. Thanks for this very thorough response, MD. I have puzzled over whether or not the old Rituxamab results would factor into the Ocrelizumab approval process, since the Rituxamab results so obviously factored into the patient population chosen for the Ocrelizumab trials. Will regulators take this into account, or allow what seems to be a rather blatant attempt at tipping the results to get by without question? I suppose the fact that attention is finally being paid to the fact that the PPMS population is not homogenous is a good thing in and of itself. I'm afraid that many MS neuros will not base their prescribing recommendations on this info, though. "Whilst there was an increase risk of breast cancer in women with MS, this was in the over 50 group"
That doesn't make it better. I must assume this was not your intended implication. I think it's a reference to the rising risk of breast cancer as women (and men) age. MD went on to summarise (I think) another paper: "The overall incidence rate of breast cancer is 201 and 206 per 100,000 person years for patients with MS and those without MS, respectively. There is no association between MS and overall risk of breast cancer. The incidence rate of premenopausal breast cancer is 81 and 86 per 100,000 person years for patients with MS and those without MS, respectively. There is no association between MS and premenopausal breast cancer. The incidence rate of postmenopausal breast cancer is 163 and 173 per 100,000 person years for patients with MS and those without MS, respectively. Overall, the risk of postmenopausal breast cancer is 13% higher among MS patients, which is statistically significant." Another concern regarding Ocrelizumab (actually, all of the immunosuppressant drugs): even if successful, these drugs do nothing whatsoever to address the underlying and as yet undiscovered cause of the disease, and thus do not a whit to even approach a "cure". The financial success of these drugs has moved the vast preponderance of MS research in the direction of newer and better ways to tinker with the immune system, instead of searching for that as yet undetermined cause. While the success of the latest generation of MS drugs has undoubtedly improved the quality of life of MS patients and and has quite likely bent the curve of the disease, it is that same success that has siphoned much-needed research funding and effort away from discovering the holy grail of MS research, a cure that will relegate MS to the dustbins of history. Those of us suffering from this scourge, especially the progressive forms, can't help but feel like pawns in a big money game that is filling the coffers of the medical industrial complex. When patients are considered consumers first and foremost by Big Pharma, and this mindset seemingly leads only to efforts which turned hideous diseases into manageable affairs, the hope for a cure seems ever dimmer. Not so sure I agree with WK on this. Not all immunosuppressives are made equal. Anti-CD20 takes out the B-cell. It is not quite a sledgehammer, but if could work out exactly how it works we may find the cure for MS and at the same time go a long way to proving the cause of the disease. For example, anti-CD20 therapies target EBV infected B-cells. Is this its mode of action? We need to think smart. Hi Dr. G, thanks so much for replying to my comments. I have given consideration to the idea that the anti-CD 20 drugs may in fact work by eliminating the EBV viral load in treated patients. But, if so, this is an "accidental" benefit. I would love to see robust research done on anti-EBV strategies and their impact on MS and other autoimmune diseases. Something tells me your team may be working on just such research. The same mechanism of action may be true for HSCT as well, since it eliminates all of the body's immune cells, and along with them EBV. I've even had the thought that the reason the majority of HSCT patients eventually see their disease activity resume may be that they get re-infected with EBV at some point after treatment, which once again triggers their genetic predisposition for MS. Could it be that the elimination of EBV down regulates activated "MS genes" (perhaps endogenous retroviruses), and the reintroduction of the virus up regulates them once again, causing disease activity to resume after a period of years? Along the same lines, might be interferon drugs work because they are strong antivirals? Novantrone has strong antibacterial and antiviral properties as well, and, despite its tremendous downsides, has been shown effective in treating some cases of SPMS. I hope you don't mind, but I have a few questions about my own very atypical case that I was hoping to be able to consult with you on off-line. Is it possible for me to send you a private email? You can contact me directly at WheelchairKamikaze@Gmail.com. Thanks once again for responding, and for all of the tremendous good you do with your research and this blog. I owe you an apology for not responding to you. I did try an engage with the neuros but they were reluctant to offer opinions but thought it was not an easy call and one did ask whether OCB occurred. Sorry for being quiet. Thanks for the response, Mouse Dr. I fully agree with your assessment of Ocrelizumab and its chances for FDA approval. Should be very interesting to see how that goes, as I think the best possible result for the MS community would be an approval for PPMSer's with active enhancing lesions only. This would not shut the door on further research, and would provide some needed hope (and, perhaps, relief) to this subset of patients. Just FYI, I have never had any OCB's. Wheelchair Kamikaze, I agree wholeheartedly with every sentence you have written here. Thank you for your eloquent words of sense. The Wheelchair Kamikaze has his own blog if you would like to read more of his eloquent writing. I agree with Kamikaze as well, although it is depressing! What would be the smartest thing to do for a PPMS'er in early/mid 20's? I am wondering the same…is HSCT worth a try?